The Infantry Tank Mk IV A22 "Churchill" Mk I (or just Churchill Mk I) is a Rank II British heavy tank with a battle rating of 3.0 (AB/RB/SB). It was introduced in Update 1.69 "Regia Aeronautica" along with the Vickers Mk.1 and Chieftain Mk 5 as an expansion to the British tech tree. As the original model of the Churchill infantry tank, it has the substantial frontal armour able to withstand enemy shells. The Churchill Mk I is one of the more capable heavy tanks at Rank 2. The tank has excellent frontal armour that can absorb and bounce shots. Tanks such as the Panzer III, T-34, M4 Sherman, and even the dreaded Panzer IV F2 can be blocked if angled. Very few tanks can deal with the Churchill Mk I effectively from the front, such as the M10 or Achilles. Its 2-pounder gun however is very underpowered for it's 3.3 BR. It is of small caliber and low penetration and damage. It's howitzer is also nearly useless as it only has HE shells. It does have a lower BR of 3.3 however. The Churchill Mk I is slow and hard to turn, which can be taken into advantage of when flanking. Its engine is also easily damaged. The thick armour is also completely unangled. Belly armour is 19 mm thick. A 8 mm Structural steel plate separates the engine and crew compartment. Ammo racks for the Churchill Mk.I. This tank can use a play style similar to the Matilda or a weaker Churchill III. It's best played up close, to make use of the armour and also gun. Since the tank is rather boxy, it's very good at angling. Unlike the Churchill III, it's gun isn't capable of taking on most other tanks of its rank. Its main role in the battlefield is to soak up and take shots, with it's thick armour, that can withstand most tanks of its rank. Main enemies for this tank would be the M10, the Achilles, the 88 mm SFL, and most Panzer IVs and StuGs. The Churchill has heavy armour, especially when it is angled, but this certainly does not mean that it is invincible. In fact, there are a lot of guns around BR 3.0 that can destroy the Churchill, even at long range. The most immediate threat comes from the Germans, as in every RB/SB battle the British will be facing them. By far the most lethal tanks are the Panzer IVs with the long barrel 75mm. 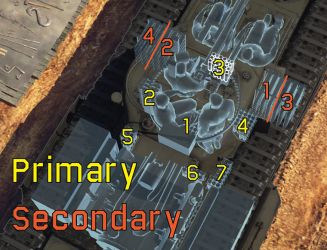 They can penetrate the Churchill Mk I frontally at long range. Later versions of the Panzer IV also have armour which the 2-pdr will really struggle to penetrate at long range, putting the Churchill at a big disadvantage. The same applies to any vehicle armed with the long barrel 75mm gun, including the Stug III F/G, Marder III H (Particularly the Marder III H which has almost 200mm penetration with APCR). The Churchill Mk I can also come across tanks like the 88mm Flak Truck which is a massive threat. The 2-pdr's 40mm is almost useless against the Flak Truck as it will have to take each crew member out individually. Luckily, the Churchill Mk I has access to the 75mm howitzer, which provides well needed explosive firepower. It can quite easily hull break the Flak Truck. Luckily, the Flak Truck is a whole BR higher than the Churchill, so it will be a rare opponent. Also, watch out for tanks armed with HEAT (such as Panzer III/IVs with the short barreled 75mm), as it has up to 100mm penetration. The Sturmgeschütz III Ausf. G is also dangerous, with a powerful HE round and a high penetration HEAT round. Luckily both of the aforementioned tanks will have to close into shorter ranges to effectively attack the Churchill Mk I, as their guns have poor ballistics. This means that the Churchill's 40 mm gun will be more effective. Also watch out for the Sd.Kfz.234/2 or Sd.Kfz.234/4. These are vehicles based on the Puma armoured car. The /2 has a 50mm and the /4 has a 75mm gun. Both are excellent flanking vehicles, extremely fast and potent. They will easily outflank the slow Churchill. Sometimes in RB matches, the Churchill will also face the Russians. At long range, the ZiS-30 proves to be a real threat. it has a high penetration gun and is great at ambushing. Luckily, it has light armour and can be destroyed easily. Russian armour is a bigger threat. Tanks like the T-34 are highly resistant to the 2-pdr gun due to their steep sloping armour. The L-11 gun on the T-34 (1940) will struggle to penetrate the Churchill, but the F-34 gun found on Post 1940 versions is much more effective. Below 500 m, the F-34 guns can destroy the Churchill with its potent BR-350B APHEBC rounds or APCR rounds (though they do less damage). An even bigger threat are the KV-1 tanks. A Churchill vs a KV-1 L1-1 can end in a stalemate situation, as both tanks will struggle to penetrate the other frontally. However, later KV-1 models have the ZiS 5 gun, which is pretty much identical to the F-34 gun found on the T-34. There is also the German premium KV-1B which has upgraded armour but a weaker gun, which is a dangerous opponent and quite common despite being a premium vehicle. From the Japanese, be careful of the Ho Ro with its massive howitzer, or the Chi Nu with its powerful 75mm gun. Almost immune to small caliber guns. It's size eliminates any recoil from the gun, making it easy to fire a second shot without losing any accuracy. Large suspension sides have side hits more likely to break tracks than penetrate the hull. Incredibly hard to dislodge or destroy when properly angled. Works well as the spearhead of an assault when capturing a point, absorbing damage. Will lose a lot of speed when making a sharp turn in motion. Has difficulties engaging another heavy tanks. Up-gunned Panzer IVs are a major threat. Poor mobility when compared to other heavy tanks from other nations. Boxy armour, although still thick. Very slow, will take a lot of time just to reach the combat zone from spawn points. Frontal 50 mm weakspot (Machine gun port). Roof armour is somehow thin. Ammo racks just below the turret, smart player will shoot there and a hit will be lethal most of the time. Priority target by planes due to size and bad reverse speed. The General Staff specification A20 was implemented before World War II and was meant to replace the Matilda II and Valentine infantry tanks. The specification was based around the British infantry tank doctrine and with the expectation that the coming war would be based off the World War I trench warfare, thus the tank was needed to travel across unfavorable terrain and able to destroy enemy defenses and infantry obstacles. As speed and heavy firepower was not taken with priority, the vehicle was to have two 2-pounder gun on side sponson mounts with a coaxial machine gun, with another machine gun and smoke dischargers on the front hull, armour was about 60 mm on the turret. Four prototypes were made by June 1940 by Harland and Wolff. The front hull would see an upgrade in armament with a 3-inch howitzer during the prototype stages, the 43 ton tank had a 300 hp Meadows engine from the Covenanter tank and was made the tank underpowered. The A20 project was cancelled with the Battle of France, which saw the emergency evacuation of the British Expeditionary Force from Dunkirk that left a majority of their heavy equipment behind. The Battle of France proved that the coming World War II was not going to be a stagnant battlefield like the trench warfare from World War I. The entire concept had to be redesigned and was done so by Henry Merrit, the director of Tank Design at Woolwich Arsenal. His new concept, the A22 or Infantry Tank Mark IV Churchill, was given to Vauxhall Motors in June 1940. War Office requested that the A22 be ready to enter production within the year due to growing pressure of a German invasion of Britain. The designs were ready in July 1940 and the first prototypes were made by December of the same year, production soon followed in June 1941. The rushed development was acknowledged in the company to being the cause of many faults and defects in the tank, but the demand by the government was so great that it must be carried out, with the expectation that the issues will be fixed during production. The Churchill tank suffered from an under-powered engine, weak armament, and mechanical issues. The weak armament from a 2-pounder was fixed with the arming of a 6-pounder on the Churchill, but the other issues caused poor performance of the Churchill in the battlefield. In fact, the Churchill production was almost cancelled in favor of the Cromwell due to its issues, but its usage in the Second Battle of El Alamein proved its value and kept it in service. The Churchill would carry on the rest of the war as one of the most versatile tank design in British service, serving in many specialist roles other than its tank role. Altogether, a total of 7,568 Churchill units produced from 1941 to 1945, with 5,968 as tanks. The Churchill, used in a multitude of roles, is made into many different variants. 12 different kinds of tank variants were produced for combat roles, with 11 more variants in specialized roles ranging from armoured personnel carrier, a bridge-layer, mine clearer, a 3 inch Gun Carrier, flamethrower tank, and an armoured recovery vehicle. The Churchill tank was first used in the Dieppe Raid in August 1942. While it was really a test on how an opposed landing would work, the 60 Churchill tanks to support the Canadian units suffered from mechanical issues, and those that did work are not able to penetrate past the sea wall due to impassable defenses. None of the Churchill tanks that landed returned from the beaches and with a 70% casualty rate, the raid's attempt to establish a beachhead was a failure. The next use of the Churchill was in North Africa during the Second Battle of El Alamein. At this point, the Churchills have been upgraded to the Mk.III variants with 6-pounders as their main armament. The detachment, code named "King Force", help supported the 7th Motor Brigade in their attack. The Churchills were fired upon by many German anti-tank weapons, but none were taken out with only one receiving note worthy damage. "King Force", as a test bed for the feasibility of Churchills operating in the desert environment, was disbanded with the establishment of the 25th Army Tank Brigade with the Churchills to see action in February 1943 in Tunisia. In the German offensive Operation Ochsenkpf, two Churchill Mk.III from the 51st Royal Tank Regiment came across an entire German transport column that they ambushed. The end result was a loss of twelve artillery pieces, 25 wheeled vehicles, two Panzer IIIs and 200 casualties on the German side with no losses for the British. The Churchill also played a key role in the Battle of Longstop Hill, where Churchill tanks in the 48th Royal Tank Regiment faced off with Germany's newest heavy tank Tiger I. Though suffering losses, a lucky 6-pounder shot from the Churchill ended up jamming the Tiger's turret and turret ring that injured the crew, forcing them to abandon the tank. The Tiger tank was captured by the British for intelligence purpose on Germany's armoured forces. The Tiger Tank is named Tiger 131. After the North African campaign, the Churchill began to see widespread usage in the British army as a support unit for the infantry. The Churchill saw much more operation hours than any other British tank in service. It was at this point that the Churchill Mk.III began a conversion into the 75 mm guns that were used on the American M4 Sherman tanks. These conversions, known as NA75, proved to be more efficient than the Shermans and were used more effectively. Some Churchills were also converted into close support vehicles with 95 mm howitzers as their main armaments. In response to the growing German anti-tank firepower in the later years of World War II, the Churchill tanks were also upgraded in armour by a large degree, though their engines were also upgraded to compensate for the additional weight. The Churchill Mk.VII, for example, has armour ranging up to 152 mm thick in the front, in comparison to the Mk.III 89 mm thick front hull. The Churchills also saw service in Europe during Operation Overlord. At the time, it was considered that the Churchill would become severely outdated with the growing tank technology, so an experimental program under specification A43, otherwise known as the Black Prince, to uparmour and upgun the Churchill. While this experimented seem fruitful, the development of more agile tanks with the same level of protection and armament such as the Centurion rendered the project obsolete. The Churchills were also given out to the Allies to help combat the Axis forces. The Australian Army received a handful of Churchills for testing alongside the M4 Sherman with the Matilda II as the basis, to which proved that the Churchill was superior in jungle warfare. Of the 510 Churchills ordered by the Australians in the war, only 46 arrived in time and were not used in the Pacific War, the rest were cancelled with the end of World War II. The USSR also used the Churchills given by the British as part of the Lend-Lease act. 301 Churchills were sent, but 43 were lost to the sea by German naval forces. Of those that arrived, the Soviets gave the Churchills to the 5th Guards Tank Army in the Battle of Prokhorovka during the Kursk Offensive. After World War II, the Churchill stuck around in the British Army until the Korean War, where the British sent the Churchill Crocodile Squadron (C squadron of the 7th Royal Tank Regiment) to Korea to fight with the Allied coalition. They fought as gun tanks in battle such as the Third Battle of Seoul. The Churchills were instrumental in some victories and were widely praised by both British and American forces and historians. After the Korean war, the Churchills remains in combat service until 1952, with the specialized bridge-layer variant stayin until the 1970s. The Irish Army also received three Churchill tanks in 1948 and another in 1949 as rentals until 1954, where they were purchased after trials with the vehicles. Despite running out of spare parts for the Churchill, the Irish Army took them in and experimented with using different engines to keep them functional, though this ended with a failure and by 1967, only one was still functional. All were retired in 1969 and one was preserved at the Curragh Camp. 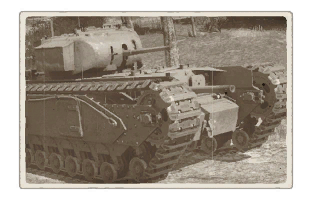 [Vehicle Profile] A22 Churchill Mk I - "First of Its Breed"
This page was last edited on 16 March 2019, at 18:27.